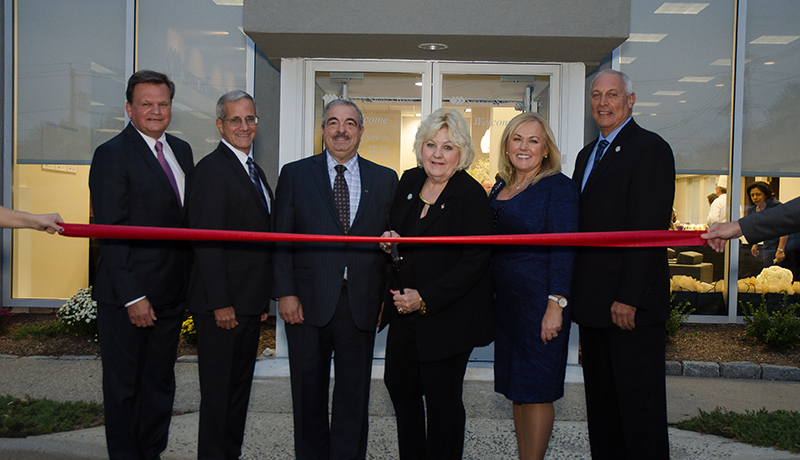 Spencer Savings Bank, a community bank headquartered in Elmwood Park, N.J., introduced customers to its newly renovated Outwater Lane branch office with a grand re-opening celebration on September 17th . The festivities gave Garfield residents and business owners a chance to tour the facility and take advantage of special promotional offers. Visitors enjoyed entertainment from the bank’s comedic robot, “Gizmo,” along with face painting, balloon animals and a variety of food including a BBQ. There was also a raffle taking place for an iPad Pro. All who attended received a bag of free giveaways from Spencer. Spencer’s Outwater Lane branch underwent an ambitious renovation project through Spring and Summer 2016 to reimagine one of the bank’s oldest and busiest offices with an eye toward the future. The building’s exterior received a facelift, while the interior was modernized with a sleek design and the latest banking technologies. A large mural featuring historic photos of the City of Garfield reminds customers that they are banking with a proud local institution. Guerrero also said he is confident that the Garfield community will be pleased with the Outwater Lane renovations, extending a personal invitation for those who have not yet visited to stop by and get acquainted with the new branch office. The Spencer Savings Bank Garfield Outwater Lane branch is located at 34 Outwater Lane.